dynamips (optional) – Cisco router emulator. gns3-gui (gns3-gui-git) (optional) – graphical user interface for GNS3 server. iouyap (optional) – Bridge IOU to UDP, TAP and Ethernet. qemu (qemu-saren-git, qemu-spice, qemu-minimal-git, qemu-minimal, qemu-patched, qemu-pinning-git, qemu-git) (optional) – Used by GNS3 to run Cisco ASA, PIX and IDS. ubridge (ubridge-git) (optional) – Bridge for UDP tunnels, Ethernet, TAP and VMnet interfaces. vpcs (optional) – Simple PC emulation for basic network operations. leo95: Thanks. Is it fixed now? @buzo the typing module is part of the standard library, removing dependency in requires.txt solves the new problem. Fixed the requirements. Thanks king007 for pointing this out. Thanx @king007. That did the trick! Simply changing the line "async-timeout<3.0.0" to "async-timeout>=3.0.0" in "/usr/lib/python3.7/site-packages/gns3_server-2.1.12-py3.7.egg-info/requires.txt" solved the issue. A temp fix for now. Hope this helps. I've hacked my way around it for now. Based on https://pypi.org/project/async_timeout/3.0.0/ Change log, the thing that changed the most is supported Python version. It dropped Python 3.4, the lowest version is Python 3.5.3. As my Arch has Python 3.7, and GNS3 also supports Python 3.7... I've changed the package requirements for the given package. I MUST SAY THAT I DON'T RECOMMEND DOING THIS!! It is really, really ugly workaround. Well, that didn't work for me, unfortunately. As it needs version even lower then v.3.0.0. 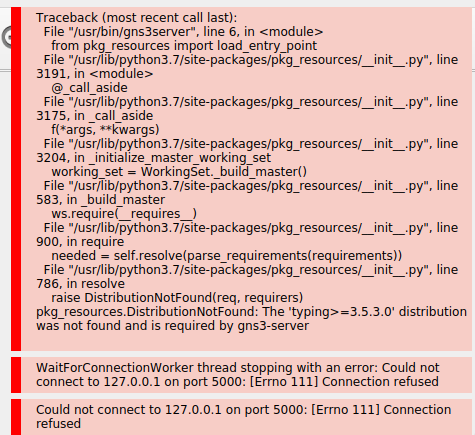 I'm not able to downgrade to version python-async-timeout-gns3-2.0.1-1 as it breaks another package.